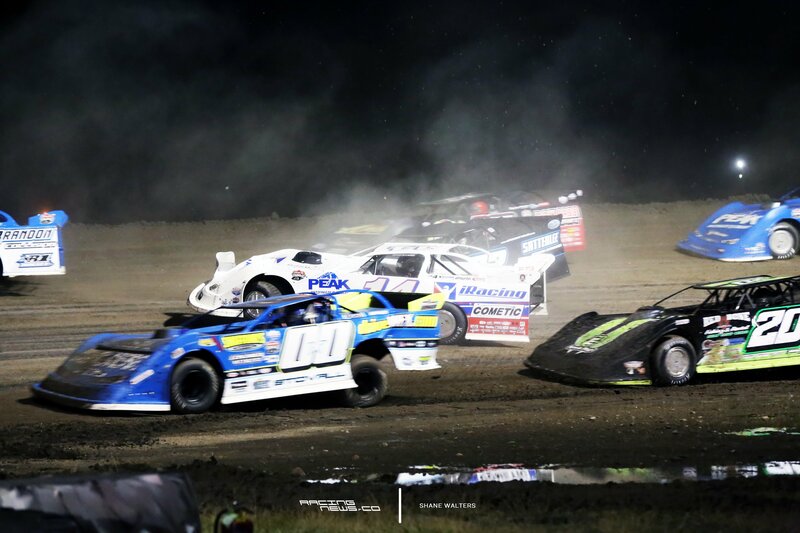 Tonight, the Lucas Oil Late Model Dirt Series unloads in South Dakota, for the first time. Brown County Speedway in Aberdeen, SD hosts the Bullet SportsWear Shootout presented by Harr Motors and Bud Light. 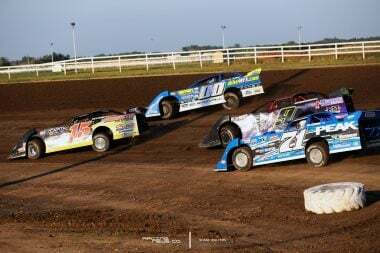 View full Brown County Speedway results below. The track was hit with two rain showers early this morning. However, a horse track circles the perimeter of the speedway. That thoroughbred track is known to kick up sand from it’s own surface onto the high banked 3/8 clay oval. 1 part clay, 1 part sand, the racing surface just absorbs the water. It’s a unique situation. Tonight, the World of Outlaws Late Model Series point leader has come to play with the Lucas crew. Brandon Sheppard is in the pitlane. Mike Marlar set quick time in Group A qualifying. He circled the 3/8 mile in 13.376 seconds. 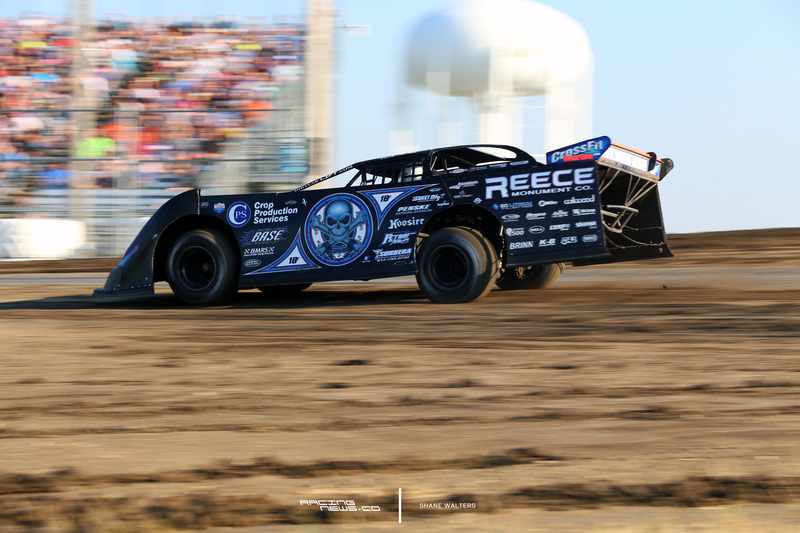 Scott Bloomquist was fastest in Group B qualifying with a time of 13.535. Mike Marlar and Josh Richards line up row 1 in the first heat. 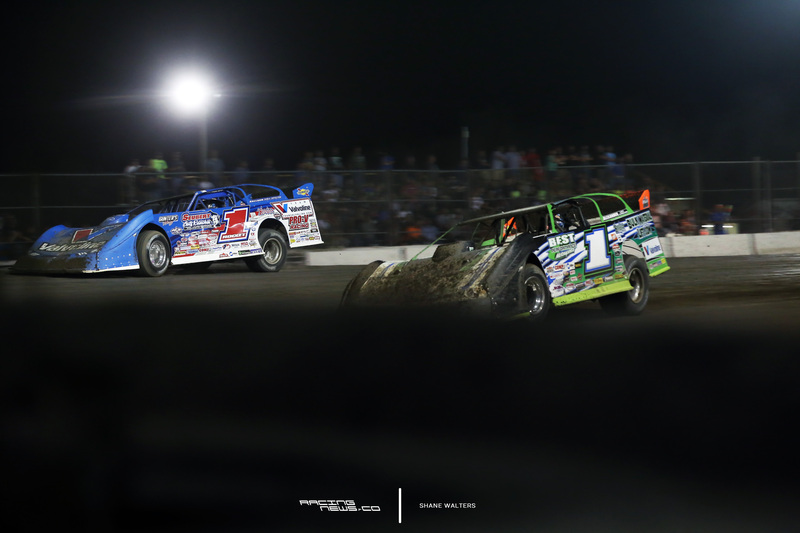 McCreadie was looking to make it 3 wide on the bottom. Richards might have checked up a bit to make room. McCreadie to 2nd. But he’s not done yet, he picks off Mike Marlar for the lead. Caution. Brandon Sheppard is around. He got a bad restart. He was already riding toward the back of the field. Green, McCreadie holds them off. He wins heat 1. Steve Francis and Jesse Stovall lead them to green in heat 2. The bottom is the place to be. Francis clears Stovall by turn 1. Stovall is exploring high. Hudson O’Neal drives under him, move the kid through to 2nd. Drivers are now using the early diamond method. Entering high, driving low and to the bottom. A big swing at the corner, most exit toward the inside tire barriers. 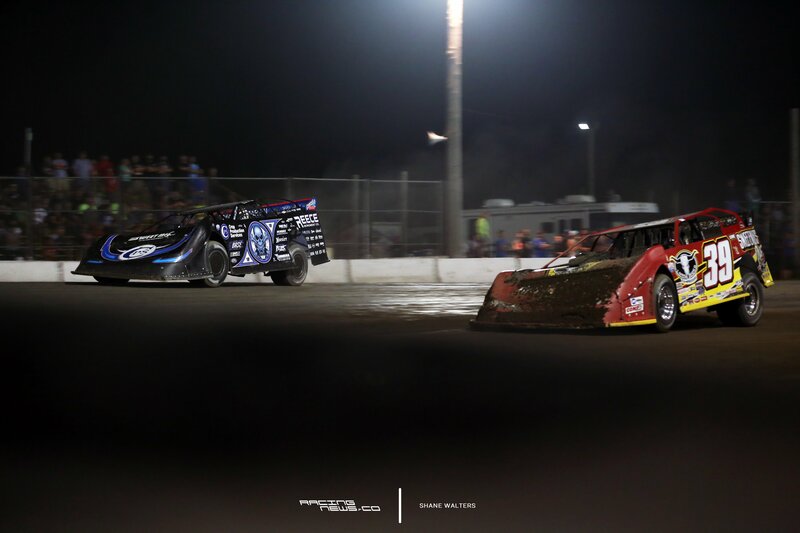 Scott Bloomquist and Darrell Lanigan line up first. Green. Bloomquist to the lead out if turn 2. Lanigan slots in 2nd. 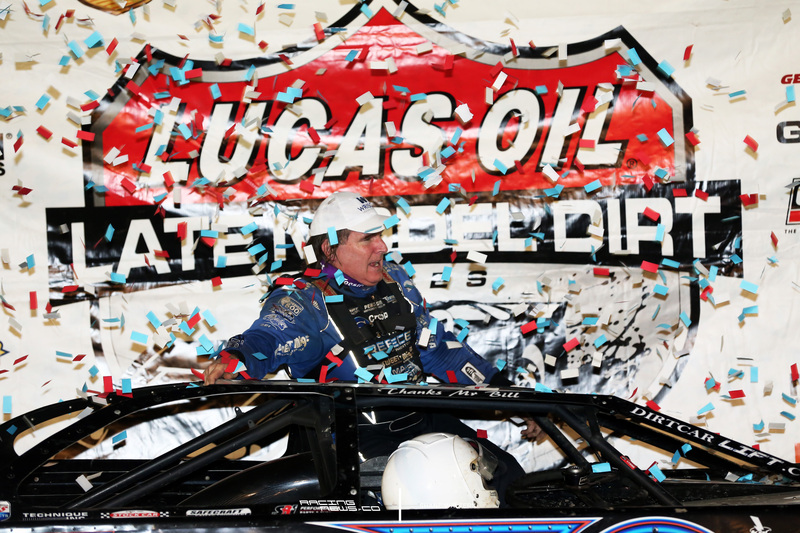 Bloomquist isn’t challenged. He wins heat 3. 37 and Erb line up on row 1. Green. The #37 takes the lead in turn 1. Erb gets a good run out of turn 2. He attempts a crossover in turn 3. It doesn’t stick. Ward drives away with it early. Erb made a last race charge but he only closed the gap. He never got close enough to think about a pass for the lead. Scott Ward wins the 4th and final heat. Track repair underway. The tilling machine has been pulled out. They begin scraping off the top groove. Earl Pearson Jr gets the jump on Terry Phillips at the start. Pearson goes to the top. The bottom lane is open, Phillips takes it. Phillips chases him down and drives to the lead. But Brandon Sheppard is coming fast. He fights for the bottom with Phillips. Sheppard gets a great drive off the corner he’s there. Phillips is forced to forfeit the bottom lane. Brandon Sheppard drives to the win. 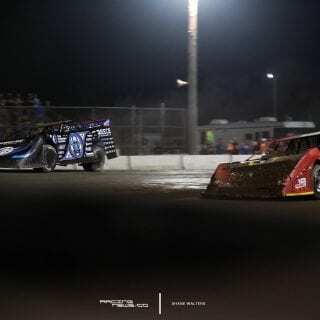 Tim McCreadie and Scott Bloomquist lead the field into turn 1. McCreadie takes the lead out of turn 2 on the bottom. Bloomquist is slipping, move Steve Francis to 3rd. Mike Marlar is around in turn 3. He collects Satterlee and several others. Not sure what sent him around. It was a quick spin, I’d assume it was a bumper that sent him around. Caution. Green. It’s a repeat of the last restart. But this time Darrell Lanigan is the spinner in turn 3, Satterlee collected again. Caution. Green. Caution. More around in turn 1. Still 49 laps to go. Finally green. 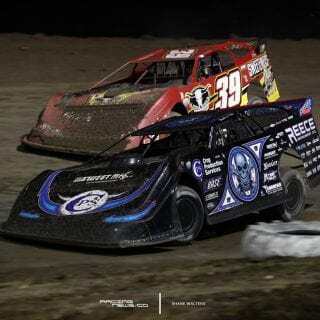 Tim McCreadie has opened a gap to Scott Bloomquist. The field quickly migrates to the bottom of the track. 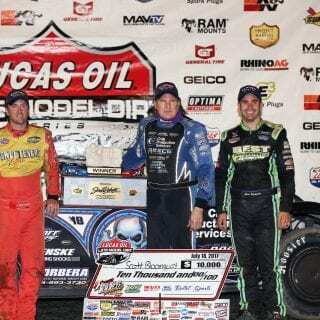 All except Brandon Sheppard. Puddles in the bottom lane have created infinite moisture. Tim McCreadie is deep in lapped traffic. He’s stuck behind the lapper. Likely uncertain if he should test the top. 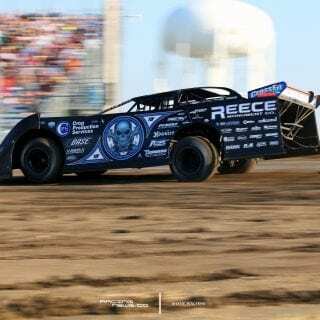 Bloomquist realizes there’s no passing to be made on the bottom, he gives the top a try. 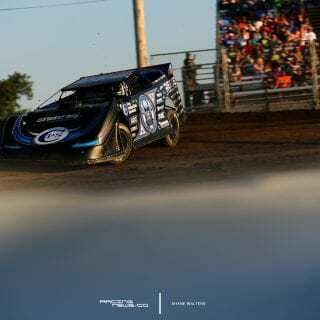 Lap after lap, Bloomquist works in the high side, on his own. He pins McCreadie behind the lapper with a different lapper on the outside. Bloomquist splits the middle, 3 wide. 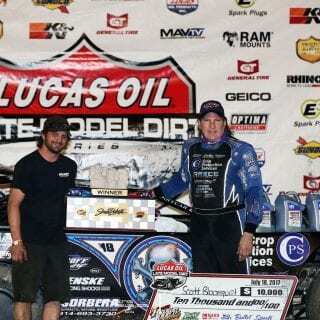 New leader, Scott Bloomquist. McCreadie saw that, he ventures to the top. 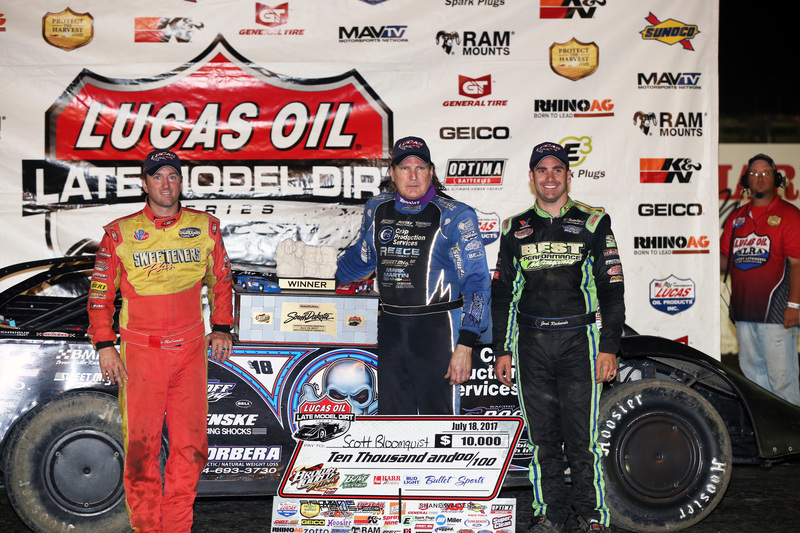 Bloomquist drops to the bottom. 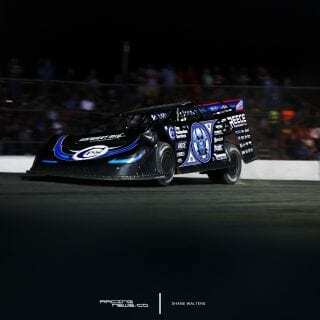 Now, McCreadie begins making ground on a Bloomquist. The zero hears him getting closer, he slides to the top in turn 1 and takes the line away. But, McCreadie is happy to go back to the bottom. This track just got racy in the blink of an eye. 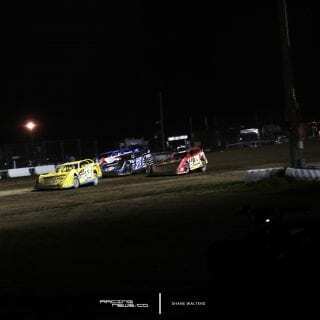 McCreadie drives hard into turn 3. Back to the bottom. New leader, Tim McCreadie. 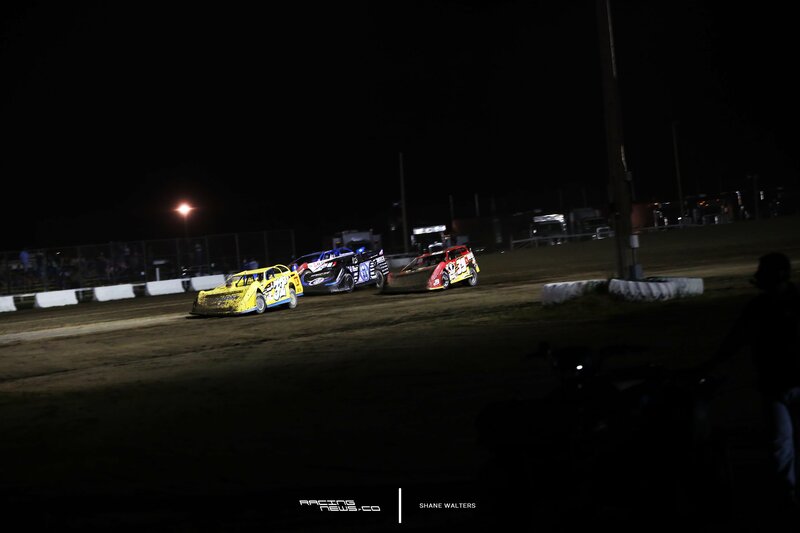 Meanwhile, Brandon Sheppard is still charging through the field. Josh Richards is another one moving to the front. They race side-by-side for 5th. 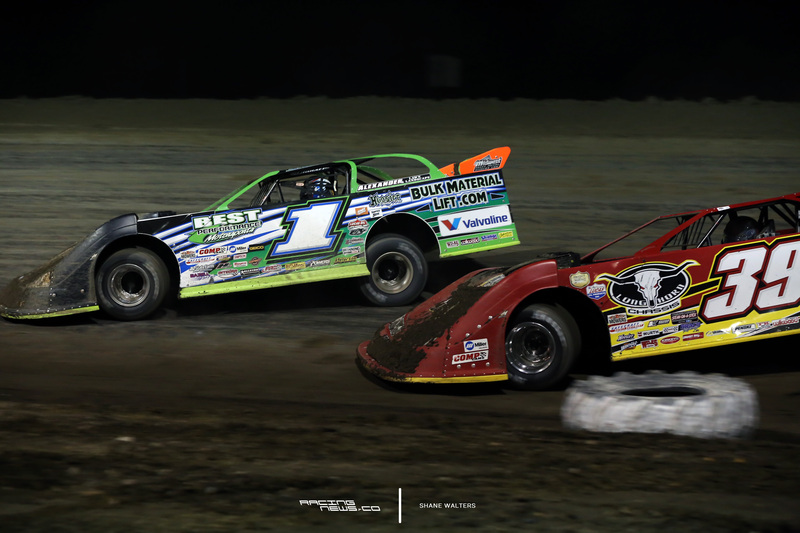 At the same time, Mike Marlar is all over the back bumper of Tim McCreadie. 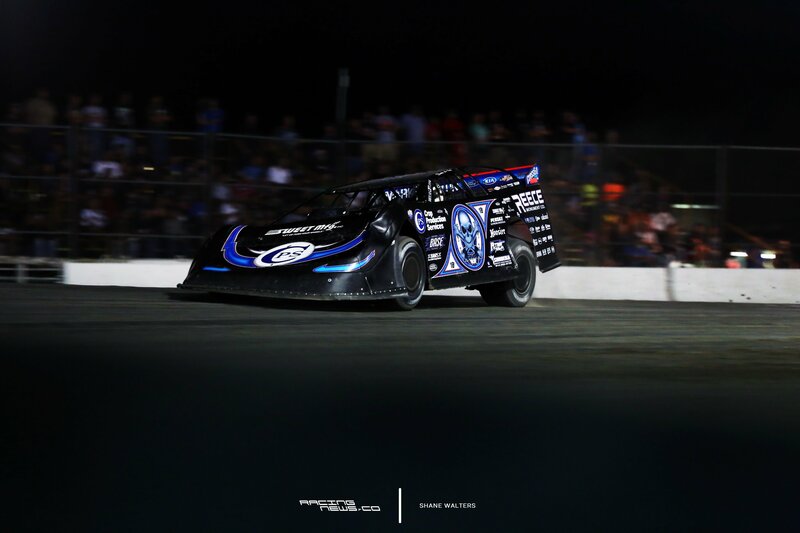 As Bloomquist and McCreadie race door to door, it’s allowed Marlar to come into the picture. Green. Josh Richards is on fire. He drives it in three wide in turn 3. 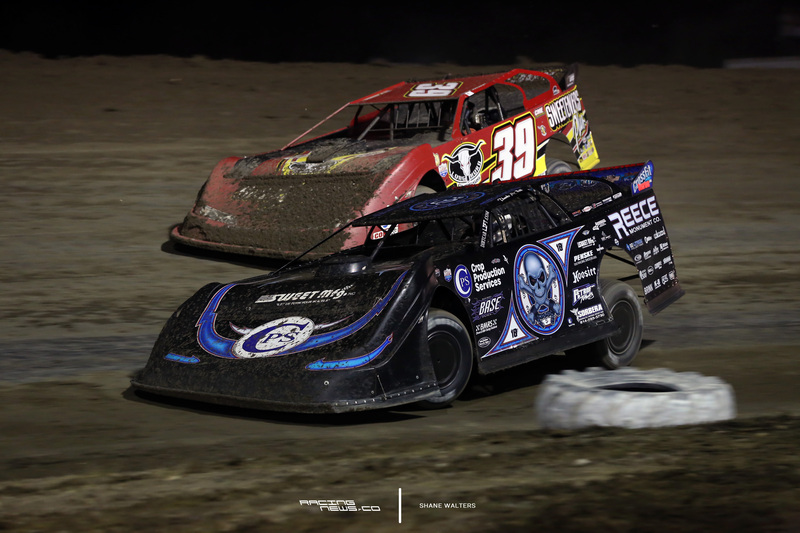 A bit of a slide, he gives a bit of an elbow to Tim McCreadie. The very next lap, the roles reverse. McCreadie dives under Richards. But the #1 driver see’s a possible elbow coming. He drives it up the banking, away from McCreadie and holds the position. 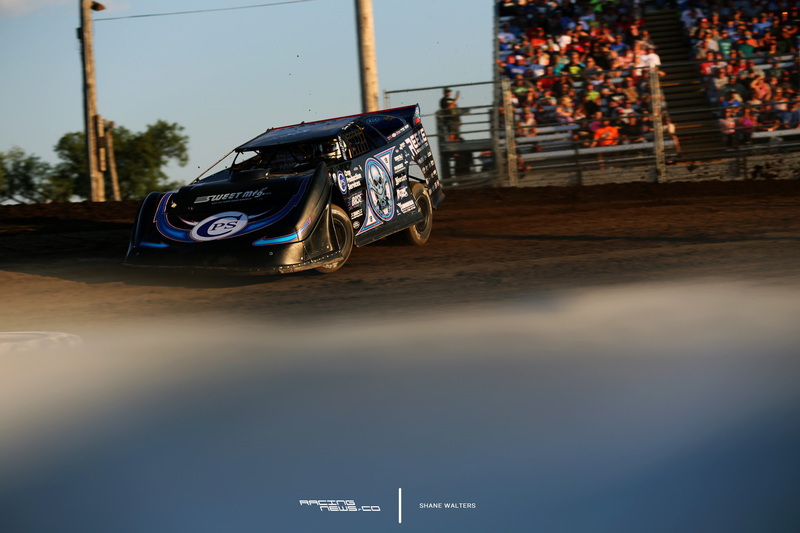 As they get racy for 2nd, Bloomquist has an opportunity to open a gap. He does. Finals laps. Josh Richards is mounting a charge to the front but he’s going to come up short. 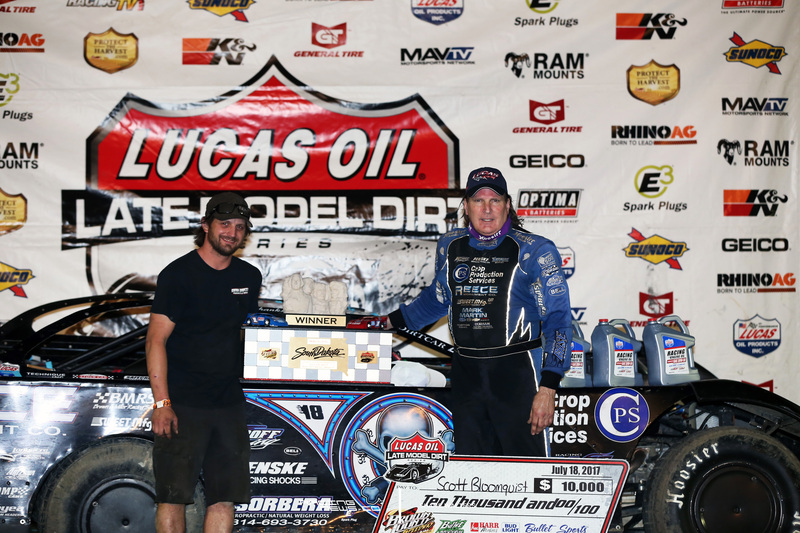 Scott Bloomquist wins at Brown County Speedway! 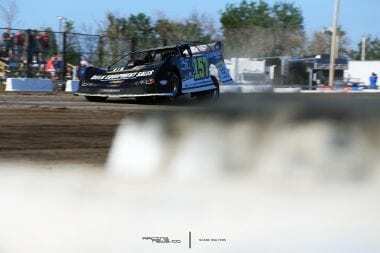 The Lucas Oil Late Model Dirt Series returns at I-80 Speedway in Greenwood, NE. 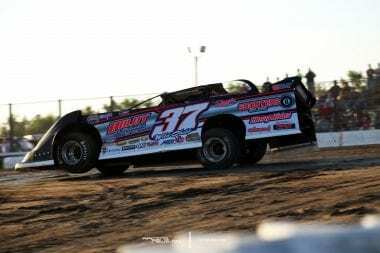 The 7th Annual Silver Dollar Nationals is a 3 day dirt late model show running from July 20-22, 2017. Lucas Oil Midwest Latemodel Racing Association Provisionals: Tony Jackson Jr.